It's time for an extra-special Christmas block party! 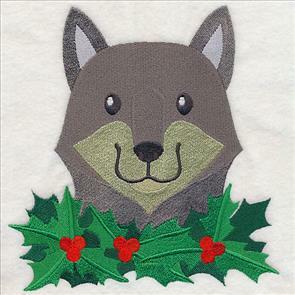 All of this week's new holiday designs have been specially created to be able to fit into a quilt block -- and they're also excellent on pillows, tote bags, wall hangings, and more. 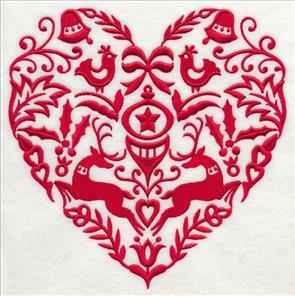 Antique ornaments, too-cute winter animals, shimmering metallic designs, and festive Scandinavian motifs are all perfect for stitching on your next embroidery project, whether it's a quilt, tree skirt, stocking...wherever your creativity takes you! Scroll down to see these new designs. 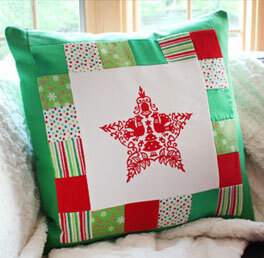 A festive design surrounded by miniature quilt blocks gives this jolly pillow a delightfully unique look. 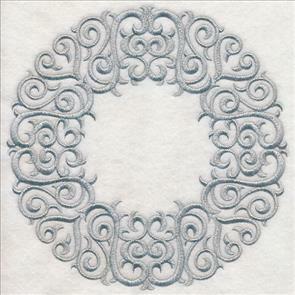 This stunning wreath adorned with intricate ornaments adds holiday flair to pillows, tote bags, and more. 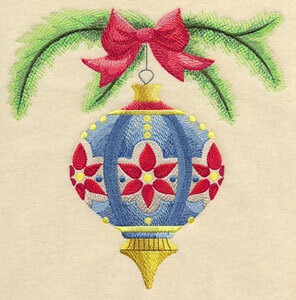 We especially love pairing the Christmas wreath with the single ornament designs below on a quilt or wall hanging. 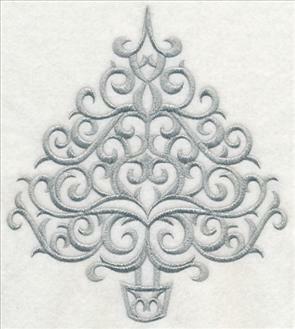 7.54" x 7.79" and 6.69" x 6.90" and 5.74" x 5.90" and 4.72" x 4.90" and 3.75" x 3.90"
Each of the individual ornament designs is modeled after the tree trimmings featured in the wreath above. 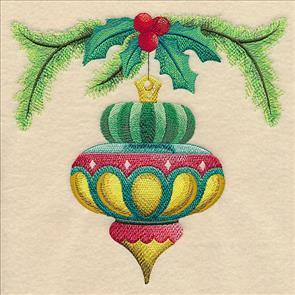 Bright colors and ornate details give the ornaments a festive look. 7.61" x 7.78" and 6.74" x 6.90"
5.75" x 5.90" and 4.80" x 4.90"
7.80" x 7.63" and 6.90" x 6.78"
5.90" x 5.80" and 4.90" x 4.79"
Antique ornaments inspired the shape, style, and colors found in these designs, and in the wreath design above. 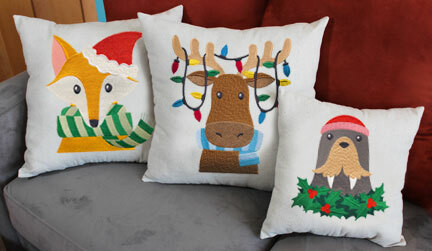 Let them adorn your next holiday project! 7.89" x 7.90" and 6.90" x 6.89"
5.88" x 5.87" and 4.89" x 4.90"
7.73" x 7.80" and 6.84" x 6.89"
5.87" x 5.90" and 4.85" x 4.90"
Each of the ornaments hangs from a pine bough adorned with a bow or holly and berries. The sprigs of greenery are a gorgeous way to bring even more holiday appeal to the designs. 7.44" x 7.80" and 6.57" x 6.89"
5.65" x 5.90" and 4.66" x 4.90"
7.56" x 7.79" and 6.72" x 6.90"
5.75" x 5.90" and 4.77" x 4.90"
These ornaments may be the perfect shape for quilt blocks and pillows, but they're also fabulous additions to placemats, trivets, mug rugs, and so much more. Pick your favorite to stitch alone, or use them all as a set! 7.63" x 7.79" and 6.69" x 6.90"
5.73" x 5.90" and 4.82" x 4.90"
7.65" x 7.80" and 6.75" x 6.90"
5.77" x 5.90" and 4.80" x 4.90"
Stitch the wreath and ornaments together on a quilt, wall hangings, or set of framed pieces. 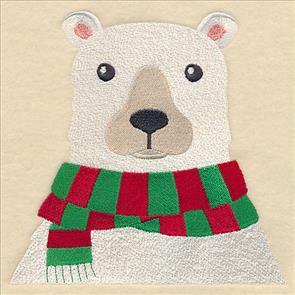 Lg - Designs smaller than 6"x 10"
Sweet, winter-ready animals are perfect peeking out on pillows, quilts, and tote bags. 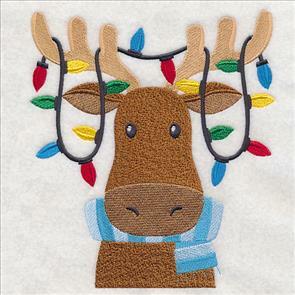 Here, a furry fox gets ready for the holidays by wearing his Santa hat; a moose is tangled up in tree lights. 6.86" x 7.05" and 5.86" x 6.02"
6.85" x 7.75" and 5.84" x 6.62"
4.85" x 5.49" and 3.41" x 3.86"
These sweet winter animals are a too-cute addition to a collection of holiday pillows. An adorable penguin and sweet polar bear bundle up in their scarves to beat the cold. 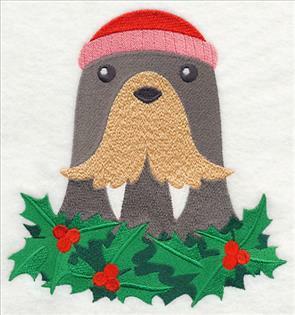 Stitch the too-cute animals on kids' gear, wall hangings, and other seasonal projects. 6.85" x 7.03" and 5.85" x 6.00"
6.99" x 6.85" and 5.98" x 5.86"
4.95" x 4.86" and 3.49" x 3.44"
We love how all six of the polar pals feature a hint of Christmas spirit -- stitch them together to showcase the whole group! 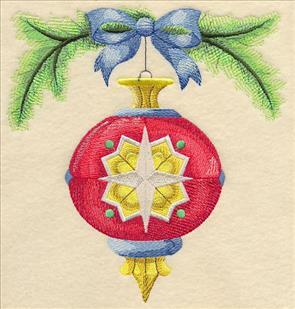 6.85" x 7.16" and 5.86" x 6.13"
6.85" x 7.25" and 5.83" x 6.17"
4.82" x 5.10" and 3.40" x 3.61"
Create a fabulous holiday project by using all the designs in this very merry menagerie! 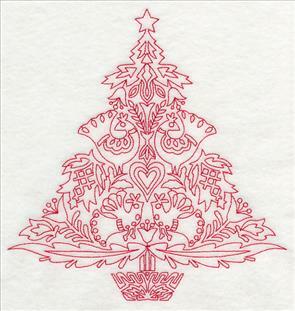 Shimmering metallic thread gives these Christmas filigree designs an elegant hint of sparkle and shine. Get our top tricks for stitching with metallic thread here, or watch the video! 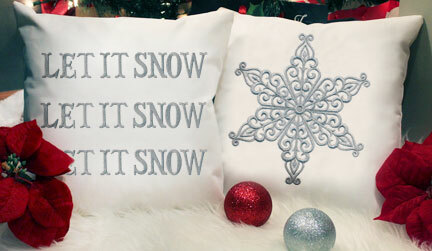 6.91" x 7.75" and 5.86" x 6.57"
4.85" x 5.44" and 3.45" x 3.86"
Showcase these metallic designs on a pair of wintery pillows. Keep them out past Christmas until the snow starts to melt! 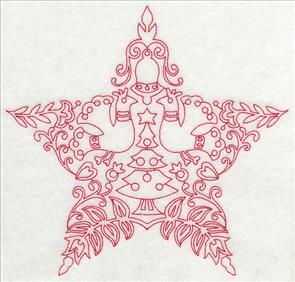 Detailed filigree gives a sophisticated edge to the star shape below. 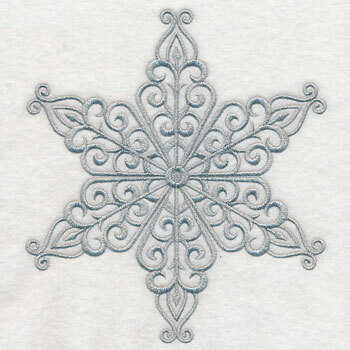 The glittery metallic thread mimics the look of a snowflake in the winter sky. 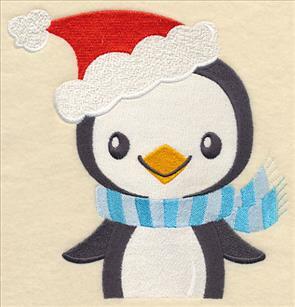 6.91" x 7.63" and 5.84" x 6.45" and 4.84" x 5.34" and 3.52" x 3.88"
Use this "Let it Snow" design as a border, repeat it several times to fill a square, or stitch singly to showcase the holiday quote. 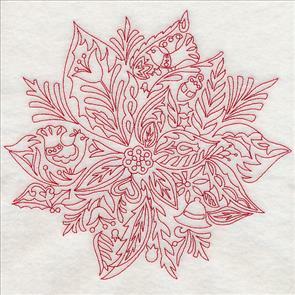 The silver metallic thread mimics the look of snow glimmering in the sunlight. 11.75" x 1.89" and 9.40" x 1.52" and 7.80" x 1.25" and 6.00" x 1.26" and 3.85" x 0.65"
Ho ho ho! 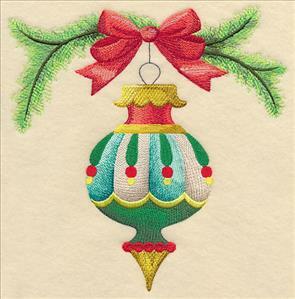 Metallic thread is an unexpected way to highlight Santa's favorite saying. 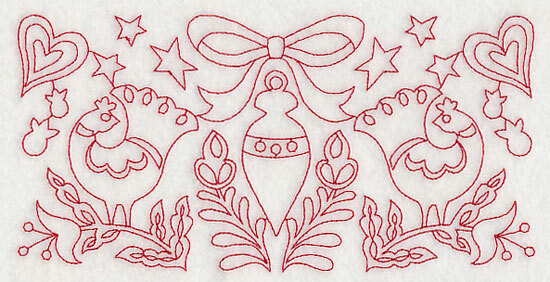 Learn more about stitching with metallic thread here, or watch the video here. 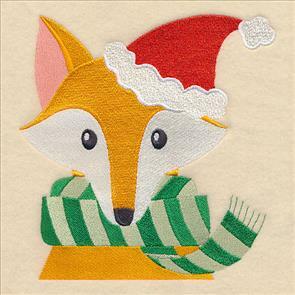 11.75" x 2.48" and 9.40" x 1.99" and 7.80" x 1.65" and 6.00" x 1.51" and 3.87" x 0.83"
Deck the halls with this "Fa La La" design! 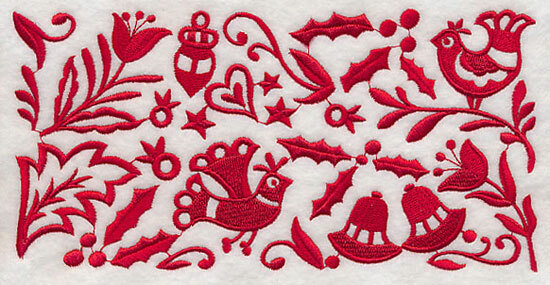 The intricate lettering gives the Christmas carol lyrics an unexpected eye-catching appeal. 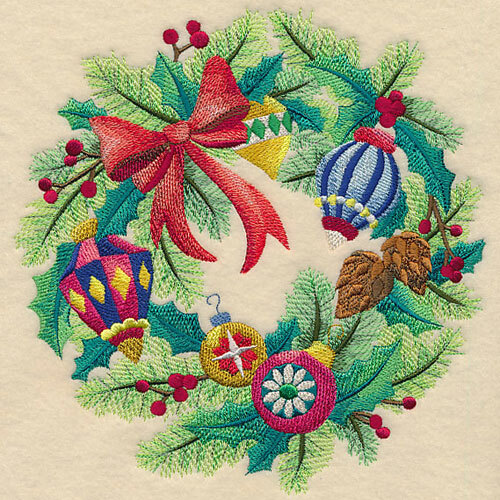 11.75" x 1.88" and 9.40" x 1.51" and 7.80" x 1.25" and 6.00" x 1.23"
The smallest size border of the "Fa La La" designs has been split into two pieces. Piece A is "Fa" and piece B is "La". 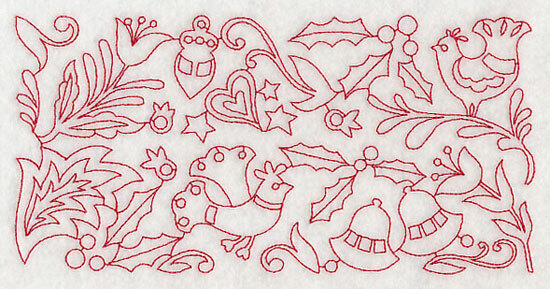 Stitch them together (using the "La" piece twice) to make your own version of the holiday phrase. 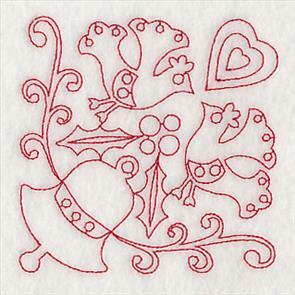 Traditional Scandinavian folk art is known for its symmetry and use of the color red. 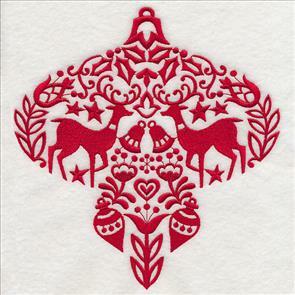 These Christmas tree and ornament silhouettes embrace the classic Nordic characteristics while adding a fun holiday twist. 7.55" x 7.80" and 6.67" x 6.90"
5.70" x 5.90" and 4.74" x 4.90"
7.39" x 7.80" and 6.54" x 6.90"
5.59" x 5.90" and 4.64" x 4.90"
The intricate detailing found in Nordic art was incorporated into these holiday motifs to add even more beauty and style to the designs. 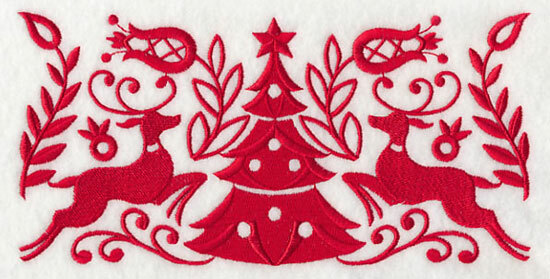 Stitch them on gift bags, tree skirts, stockings, and more! 7.80" x 7.35" and 6.90" x 6.51"
5.90" x 5.56" and 4.90" x 4.62"
6.00" x 7.80" and 5.31" x 6.90"
4.54" x 5.90" and 3.77" x 4.90"
A Christmas tree, ornament, poinsettia, reindeer, star, and heart are the perfect block designs to make up a festive Scandinavian quilt! 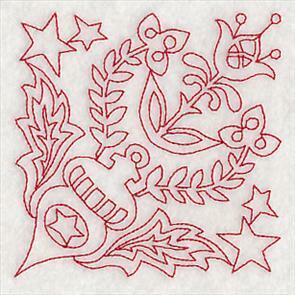 Pair them with the border and corner designs below. 7.80" x 7.39" and 6.90" x 6.54"
5.90" x 5.59" and 4.90" x 4.64"
7.78" x 7.80" and 6.88" x 6.90"
5.88" x 5.90" and 4.89" x 4.90"
Two reindeer flank a Christmas tree in this holiday border. 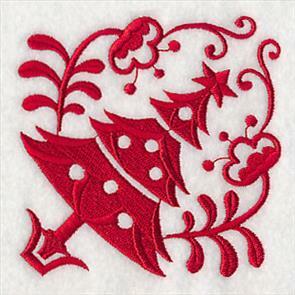 Use to adorn pillows, towels, aprons, and more. 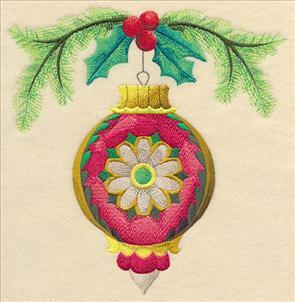 7.80" x 3.88" and 6.90" x 3.44" and 5.90" x 2.94" and 4.90" x 2.44" and 3.90" x 1.95"
Here, an ornament takes center stage in this border design. 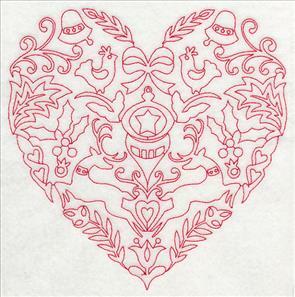 It's a delightful complement to the designs above, or you can stitch it singly for eye-catching results. 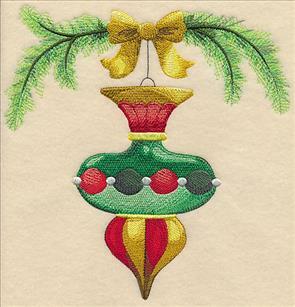 7.80" x 3.96" and 6.90" x 3.50" and 5.90" x 3.00" and 4.90" x 2.49" and 3.90" x 1.98"
Hearts, greenery, bells, and other holiday accents give this border a freeform look. 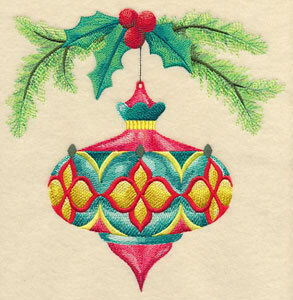 Use it on wall hangings, placemats, and stockings. 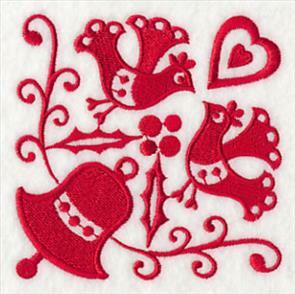 7.80" x 3.91" and 6.90" x 3.45" and 5.90" x 2.95" and 4.90" x 2.45" and 3.90" x 1.95"
Each of these Scandinavian Christmas corners are fabulous additions to napkins, pockets, and other small-scale projects. Or, use several on one project for a unique look. 3.89" x 3.87" and 3.45" x 3.43"
2.95" x 2.94" and 2.44" x 2.43"
3.89" x 3.89" and 3.45" x 3.45"
2.95" x 2.95" and 2.45" x 2.45"
Use this corner design to adorn blankets, coasters, mug rugs, and more! 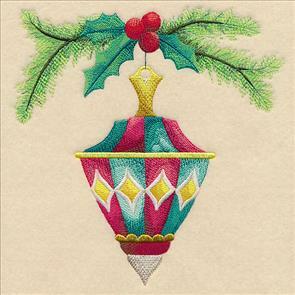 The Christmas ornament will add festive flair to a wide variety of projects. 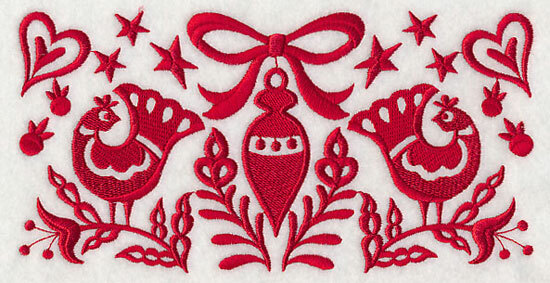 3.89" x 3.88" and 3.45" x 3.44" and 2.94" x 2.93" and 2.45" x 2.44" and 1.96" x 1.96"
These Scandinavian Christmas designs will add a holly-jolly look to any embroidery project. 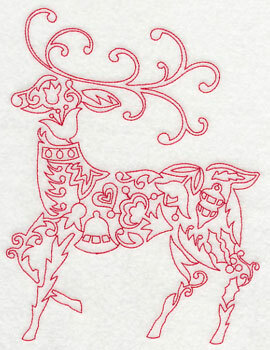 Each of the Scandinavian Christmas silhouettes are also available in a light and airy redwork version! They're sure to add a subtle, yet dramatic look to your gifts and decor. 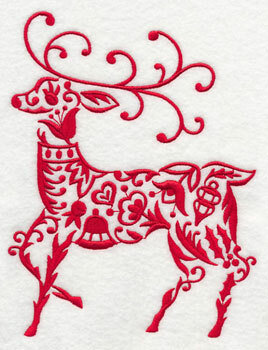 7.54" x 7.80" and 6.67" x 6.90"
7.39" x 7.80" and 6.53" x 6.90"
A poinsettia and reindeer are classic Christmas motifs, and these versions are a chic addition to gifts, decor, and more. 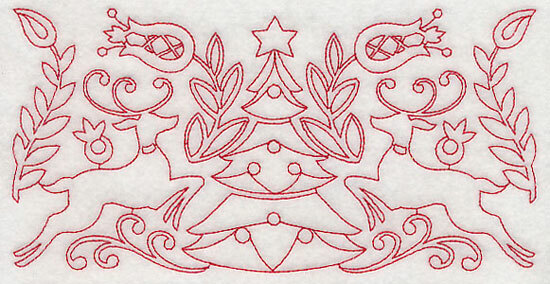 Plus, because redwork designs are light-stitching and use only one color, they're a delightfully quick-stitch option when working on your Christmas projects. 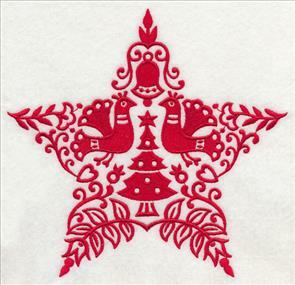 7.80" x 7.35" and 6.90" x 6.50"
5.90" x 5.56" and 4.90" x 4.61"
4.53" x 5.90" and 3.77" x 4.90"
A star and a heart made up of holiday elements will be beautiful additions to pillows, stockings, shirts, and more, and are always a popular choice for seasonal projects. 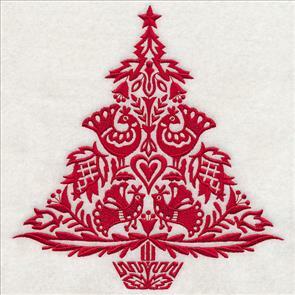 Stitch the Christmas silhouettes on placemats, aprons, and tree skirts. 7.80" x 7.41" and 6.90" x 6.55"
5.90" x 5.60" and 4.90" x 4.65"
5.88" x 5.90" and 4.88" x 4.90"
Use this holiday border as an adornment on bed linens, dish towels, tablecloths, and other light-stitching seasonal decor. It's fast and fabulous on a wide variety of projects! 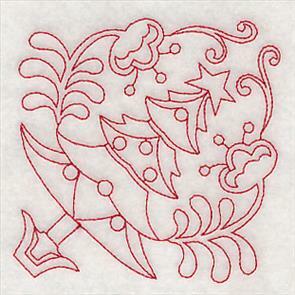 7.80" x 3.90" and 6.90" x 3.45" and 5.90" x 2.95" and 4.90" x 2.45" and 3.90" x 1.95"
Light running stitches give this embroidery design an open and airy look, while filling it with beautiful holiday elements, such as stars, greenery, and hearts. 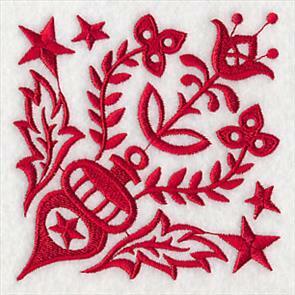 7.80" x 3.90" and 6.89" x 3.45" and 5.90" x 2.95" and 4.89" x 2.45" and 3.89" x 1.95"
Each of these redwork Christmas designs have all the beauty and grace of the stitch-filled versions, but are faster to stitch and great for lighter fabrics, too. Use on pillow shames, table linens, kitchen towels, tote bags, and more. 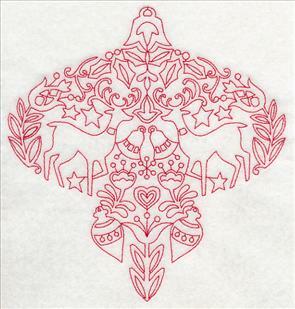 7.80" x 3.88" and 6.90" x 3.43" and 5.90" x 2.94" and 4.90" x 2.44" and 3.90" x 1.94"
Use these corner designs alongside the borders and silhouettes above on one project, or stitch singly to showcase the intricate designs. They're excellent additions to apparel, placemats, and more. 3.88" x 3.88" and 3.44" x 3.44"
2.95" x 2.95" and 2.44" x 2.44"
3.87" x 3.87" and 3.44" x 3.44"
2.94" x 2.94" and 2.44" x 2.43"
These Scandinavian-inspired designs are sure to give your Christmas decor a fresh, eye-catching look. They're a stylish way to decorate for the season. 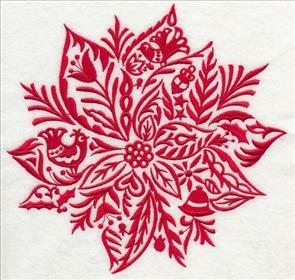 3.88" x 3.88" and 3.44" x 3.44" and 2.94" x 2.94" and 2.44" x 2.44" and 1.95" x 1.95"
These redwork designs are light and lovely additions to holiday decor, apparel, and gifts. 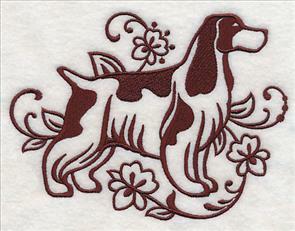 Jenni loves the way the graceful dog designs stitch out, and is especially a fan of using them on tea towels. 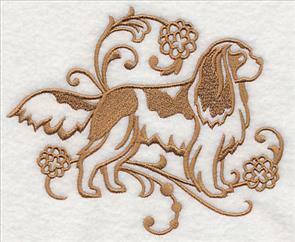 She was curious if we were going to create any more dog breeds in this style, and was hoping we'd be willing to digitize a Cavalier King Charles Spaniel and an English Cocker Spaniel. Thanks for the suggestion, Jenni! We love the way these dogs look on tote bags, apparel, and pillows. 6.53" x 4.86" and 3.88" x 2.89"
Do you have an idea or suggestion for a new design? Let us know! 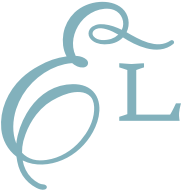 Send an email with a description of your idea to support@emblibrary.com. The most recent additions to the Request of the Week program are shown above, and you can find past requests here.